Rob Kiser|Call Photo Piqua’s Kenzi Anderson makes a catch in left field against Urbana Thursday. 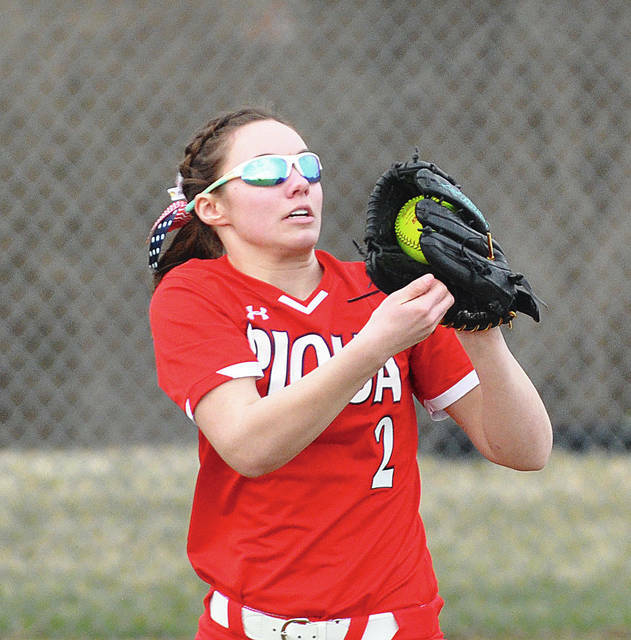 Rob Kiser|Call Photo Piqua’s Hannah Anderson snags a wide throw at first base Thursday against Urbana. Rob Kiser|Call Photo Piqua’s Mariah Blankenship fires a strike against Urbana Thursday. Rob Kiser|Call Photo Piqua’s Chai Sowers gets a bunt down against Urbana Thursday. Editor’s Note: This story will appear in Saturday’s Miami Valley Today. PIQUA —- It wasn’t perfect. But, with a team starting three freshman and having a sophomore playing a different position —- it will be a growing process. And in the end, Piqua softball held on for a 13-9 win over Urbana to move them to 2-1 on the season. And there were a lot of positives for Piqua, particularly in the early going. First, Piqua got out of a jam in the first. Urbana’s first three runners reached. 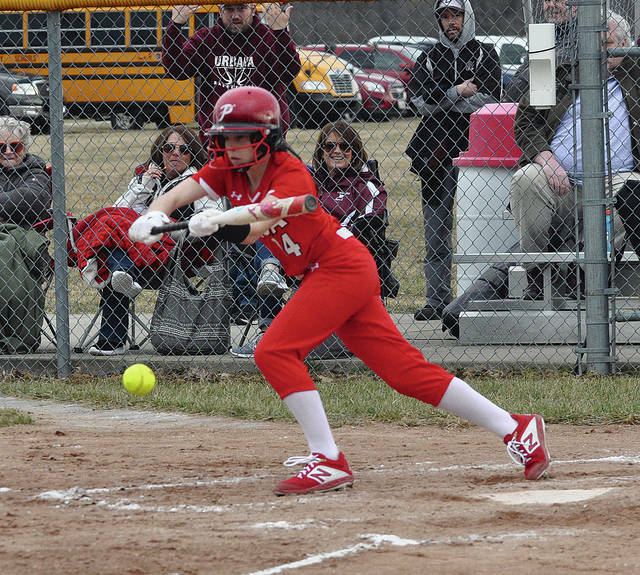 Jennifer Zabrowski had an infield single, Makenna Radford reached on an error and Emily Skelley singled in Zabrowski —- but Mariah Blankenship was able to get out of it without any further damage. “Mariah (Blankenship) did a good job with her location,” Campbell said. 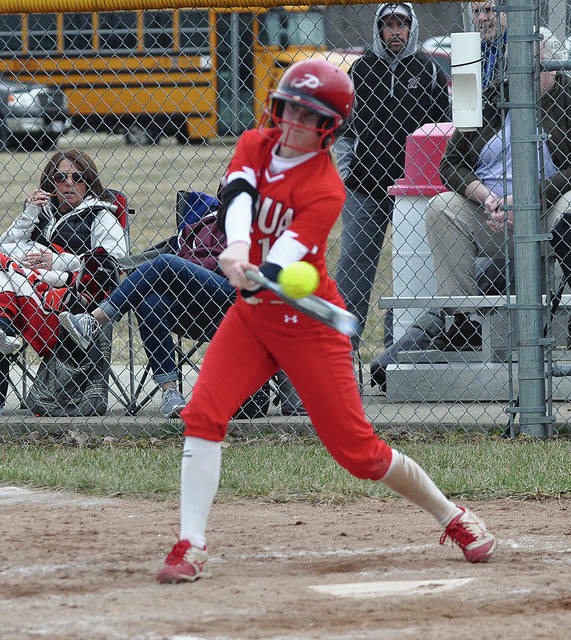 And it didn’t take Piqua freshman Reagan Toopes long for her first high school home run. She led off the home first with a shot over the leftfield fence and Hannah Anderson followed with a double and scored on Kenzi Anderson’s single to make it 2-1. Piqua then appeared to break the game open with an eight-run third to make it 10-1. 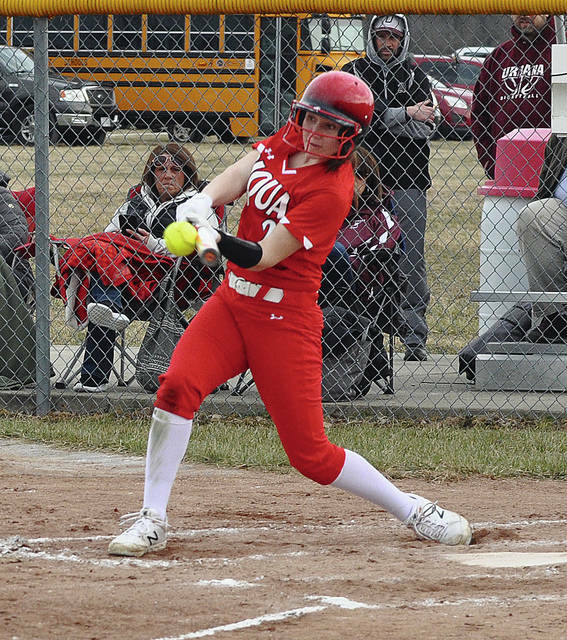 Kenzi Anderson and Chaia Sowers had RBI singles in the rally, while Paige Hinkle drew a bases-loaded walk to score a run and Kylie Trissell had a fielder’s choice to bring in a run. But, Urbana countered with two runs in the fourth, four in the fifth and two in the sixth to make things interesting. Piqua did enough to stay in front though. In the fourth, Hinkle doubled and came around to score on Kenzi Anderson’s ground out and in the fifth, Sowers singled and scored when Toopes reach on an error and Toopes crossed the plate on Hannah Anderson’s sacrifice fly to the deepest part of centerfield. Blankenship set Urbana down in order to finish off the win. She struck out eight and walked five, while scattering 12 hits. Skelley and Marah Donahue combined on a 10-hitter for Urbana, striking out three, walking three and hitting one batter. And take a 2-1 record to Trotwood-Madison Friday, weather permitting. https://www.dailycall.com/wp-content/uploads/sites/30/2019/03/web1_kenzi3.jpgRob Kiser|Call Photo Piqua’s Kenzi Anderson makes a catch in left field against Urbana Thursday. 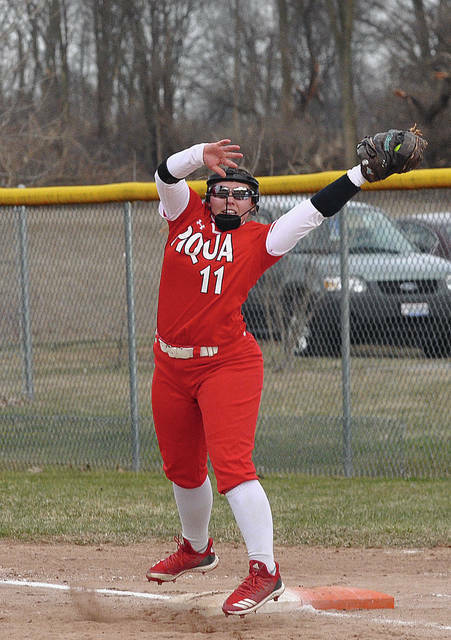 https://www.dailycall.com/wp-content/uploads/sites/30/2019/03/web1_hannah-1.jpgRob Kiser|Call Photo Piqua’s Hannah Anderson snags a wide throw at first base Thursday against Urbana. 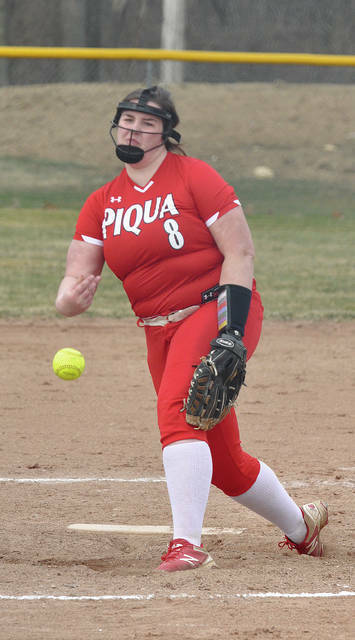 https://www.dailycall.com/wp-content/uploads/sites/30/2019/03/web1_mariah.jpgRob Kiser|Call Photo Piqua’s Mariah Blankenship fires a strike against Urbana Thursday. https://www.dailycall.com/wp-content/uploads/sites/30/2019/03/web1_chai.jpgRob Kiser|Call Photo Piqua’s Chai Sowers gets a bunt down against Urbana Thursday.